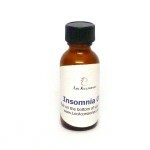 All natural ingredients (sweet almond oil and pure essential oils) used to aid in a good night sleep. Rub a small amount in the palms of your hands. Apply to each feet, one at a time.